Kendal Town Hall dominates the top of Lowther Street, where Stricklandgate and Highgate meet. It can be seen from most parts of the town above the roof tops, with the clock tower being especially visible. The building is an amalgamation of various building periods, and is built on the site of the town’s White Hall, also known as Leaden or Leather Hall, which was once used as the cloth exchange for the cloth trade in Kendal. Cloth was traded with the Americas during this period, with large amounts being shipped out to Virginia. In 1825, the White Hall was purchased and a new White Hall, designed by Kendalian architect Francis Webster, was built in its place. The new White Hall contained a billiards room, newsroom and a lecture hall that also doubled as a ballroom. Above. 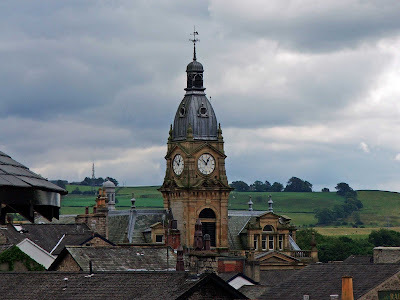 Kendal skyline, dominated by the Town Hall clock tower. Above. 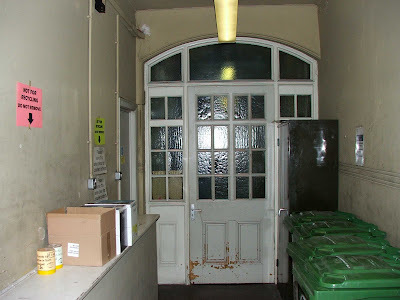 The original entrance to the Post Office on Lowther Street. It is reputed that one of George Romney's very first commissions, was to paint a hand holding a letter, that was used to indicate the location of the Post Office. 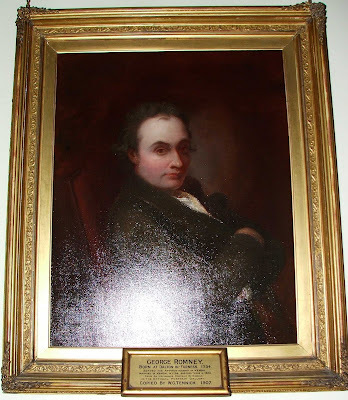 There is at least one reproduction of this small painting in Kendal Museum. Above. 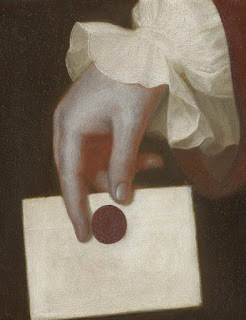 Hand holding a letter, by George Romney. Above. 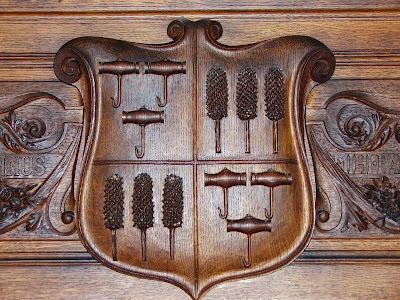 Kendal's coat of arms above the fireplace in the Bindloss Room. Above. 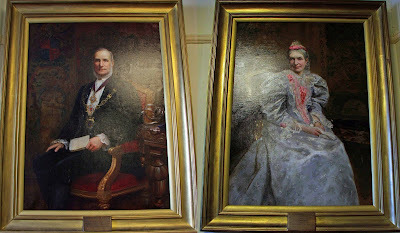 Mayor Bindloss and his wife...benefactors of Kendal Town Hall. The town hall is home to an extensive gallery of past Aldermen and mayors. In the Town Council chamber there is a collection of original and copy paintings, detailing some of the more well known past mayors of the town, whilst in the main corridor on the ground floor, there are a number of photos of mayors of Kendal, and Chairmen of Kendal Town Council and South Lakeland District Council from the past 30 years or so. Above. 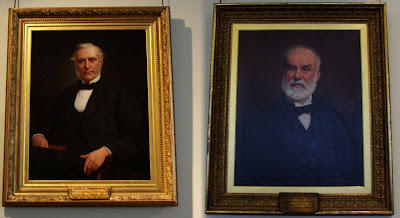 A few portraits of some of Kendal's Mayors of days gone by. Above. George Romney. World renowned portrait artist and one time Mayor of Kendal. Hidden away on the first floor at the front of the town hall is the Mayor’s parlour. This room is home to some of the more valuable and rare antiquities that the town possesses. For example, there is Queen Katherine Parr’s book of devotions. The book is one of the last surviving items owned by the Queen, and was bought by public subscription for the town in 1936. The town’s regalia, Sword of state and maces, are also kept safely here, as are the town’s charters. The Sword was presented to Kendal on behalf of Charles II, and is said to be one of only twenty (or 47...Kendal Town Council's website seems a little confused!!) to be presented to towns across England. The maces were presented to Kendal in 1647 and 1648, and both maces and the sword are used during ceremonial affairs. 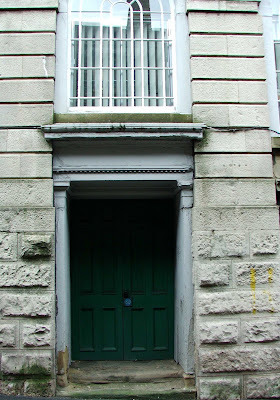 Outside the town hall, and to the left of the main entrance, there is a curious lump of stone set into the wall. 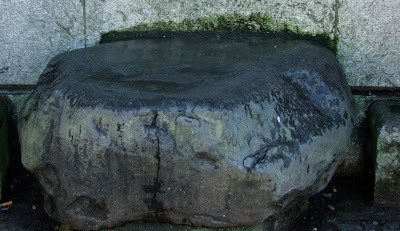 The story goes, that this piece of stone was once part of base of the town’s Market Cross and originally stood in Stricklandgate near the market place. It is, so the story goes, called the Ca Steean, or the Cauld Stean, and was used as a place from which important local and national events were announced. The accession of King Edward VIII and George VI and Elizabeth II were announced from this spot, as well as the ill fated Prince Charles, aka Bonnie Prince Charlie. It is unlike any cross base that I have ever seen....there appears to be no socket into which a cross could or would have been mounted (unless the stone is now upside down and the socket is out of sight) The stone was used as a meeting spot for George Fox, the Quaker preacher, when he addressed the crowds in Kendal in 1652. At this time, it was situated in the market place. However, it was moved when the market place was reduced in size, to where the current war memorial is situated. When the library at the head of the market place was demolished, it was again moved to its present home outside the town hall and underneath the Bindloss’s foundation stone. Above. The Calling Stone, from which Prince Charlie was proclaimed King in 1745. These days the town hall is home to Kendal Town Council, and also a meeting place for clubs and classes. 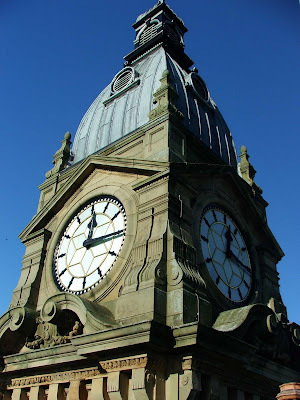 Run by South Lakeland District Council it is an important piece of Kendal’s architectural history. 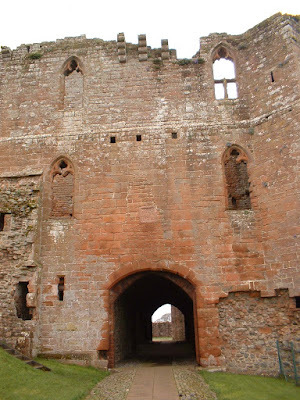 The buildings that make up Brougham Castle. The gatehouse sits at the North of the castle, and consists of three visible parts. Firstly the outer gatehouse, secondly a small courtyard, and lastly, the inner gatehouse. The outer gatehouse was built after the inner gatehouse, and the combination of the two structures would have made it incredibly difficult to enter the castle uninvited! Those who would have chosen to do so, would have been easily observed from the guardroom on the North wall. Beneath this building, the remains of the dungeon still exist. 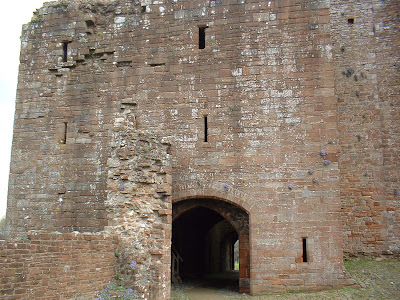 The inner gatehouse, which is the original entrance to the castle, was a self-sufficient structure. It was fitted out with its own portcullis and gates. 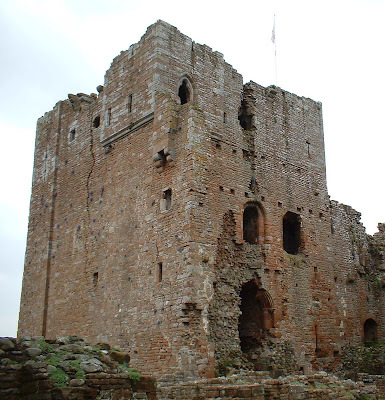 It was in around 1300 that Robert Clifford decided that the outer gatehouse was required…..and addition designed to make the castle even more impregnable. Both of the gatehouses are of two storeys. The courtyard that lays between the two gatehouses, was equipped with lodgings on the river side of the buildings. This area would have acted as a ‘murder zone’ in the event of an attack! 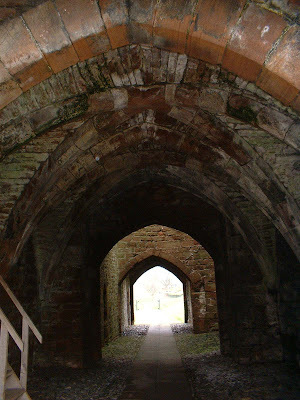 If those attacking had managed to break through the outer gatehouse, they would have found themselves under attack from the walls around the courtyard before they could lay siege to the second or inner gatehouse. The chances of getting through the courtyard were therefore low. The inner gatehouse is well equipped with observation points for the postern that is cut into the Western of the two outside buttresses. This postern, or defendable gate in the wall, would have provided a way in and out of the castle when the outer gatehouse was closed. 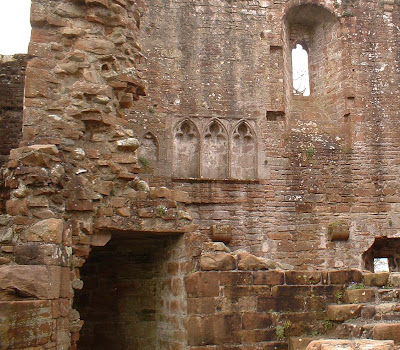 A flight of stairs led to a watchman’s chamber from the courtyard at the foot of the inner gatehouse. From here, he would have been in complete control of the portcullis and gate. The courtyard would have been cobbled pretty much as it is today….providing good footing for horses and men in wet weather. Approaching the South West corner of the castle’s courtyard, there is another postern gate. This one crosses the moat outside the castle’s walls and is much older than the causeway, which was probably constructed for Lady Anne Clifford as a quick easy way in and out of the castle. 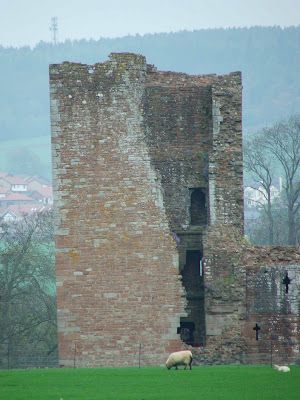 The Tower of League sits at the South West of the castle, and was built by Robert Clifford in around 1300, the same time that he built some of the stone curtain walls. 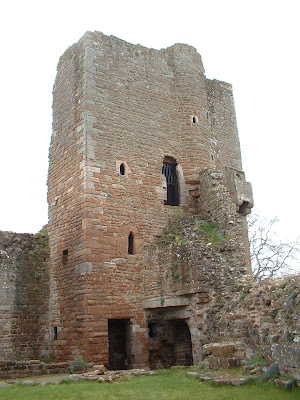 The tower would not only have provided protection from attacks, but would also have provided a place of refuge if attackers had managed to enter the castle and make their way through the triple protection of the gatehouses and their courtyard. In 1723, the tower was referred to as the Tower of Liege….literally meaning the Tower of Lordship. It would also have provided luxurious apartments. Each of the floors would have constituted a single chamber, with their own latrines and fire places. 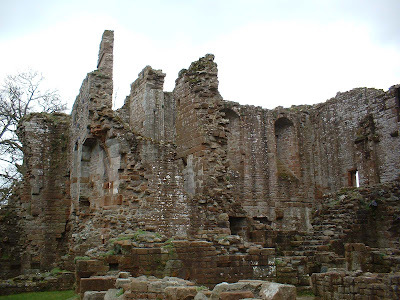 The garrisons are built along the South curtain wall, and would have been the castle’s communal rooms, where troops garrisoned at the castle would have eaten, slept and prayed. The first room of these buildings would originally have had three storeys, although this range were reduced to just two sometime in the past. No date has been attached to the building of this range, but it was probably built by Roger Clifford in response to an increase in Scottish raids, possibly in the 1380’s. These buildings provide clear evidence that the castle was regularly garrisoned with a formidable array of troops. The Chapel is also situated against the South curtain wall, and was probably built by Roger Clifford, again in the 1380’s. Documents from 1385, state that Roger Clifford had 30 men at arms (cavalry) and 60 archers garrisoned at the castle. This was in addition to an undisclosed number of other troops who were there already. 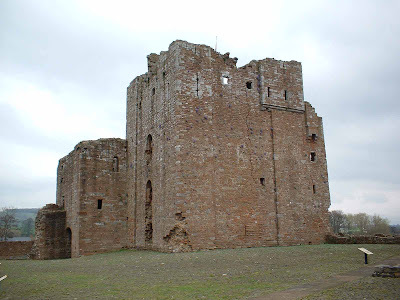 In the 14th century, there may have been as many as 100 men stationed at Brougham castle. The most visible remains of the chapel today, are the three arched sedilia windows set high up on the wall. Although they’re all bricked up, they’re well preserved. The left of these windows, the small piscine can still be seen, set into the wall. This small recess would have been used to wash the holy vessels in which the sacrament would have been served. The inner courtyard is quite a large area. 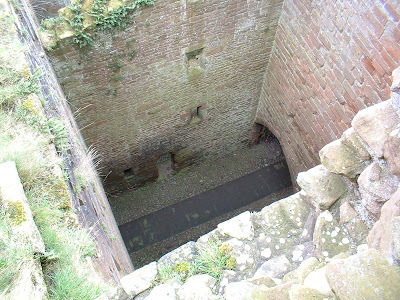 It contains one of the castle’s wells. Beyond this stood the kitchens, built close to a water supply for obvious reasons. A causeway across the Roman fort ends against the wall here, probably indicating that it was there before the curtain wall was built. 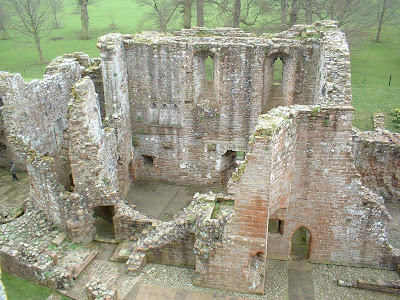 The kitchens are situated at the South East corner of the castle. Entering the kitchen at the present level, takes you into what would originally have been the kitchen’s basement. The next room would have been the castle’s second hall, built by Roger Clifford. The stone now embedded high up on the external wall of the outer gatehouse, and inscribed “Thys Made Roger” would originally have been set in the entrance to the hall. 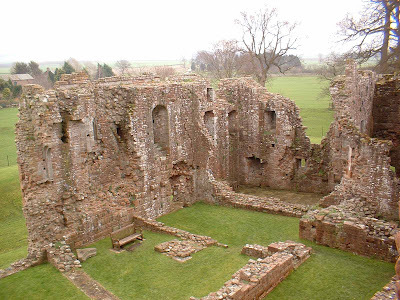 The windows on the outside of the hall, looking across the Roman fort, are unusually large for a defensive wall. It’s therefore probable that they would have been covered by wooden shutters when required. This room would have been the castle’s original hall. It was essentially the private residence for the lord of the castle. 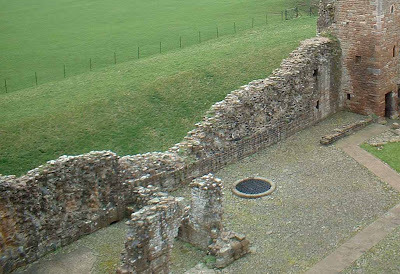 The only remains of the Great Chamber now, are the footings at the base of the keep. 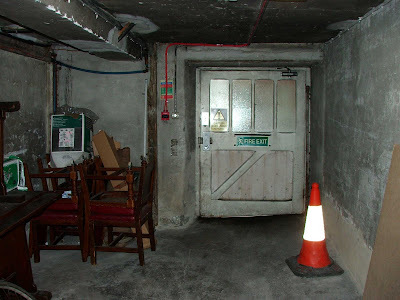 In the 13th century, the Great Chamber would have been a massive three storeyed building with a good sized basement. The Keep is the oldest part of the castle still standing today. The lower three storeys of this massive structure are dated to around 1175, taking into account their similarity to other buildings of this time. There’s no solid proof of this dating however, as Robert de Vieuxpont’s documents indicate that the castle was not started until sometime after the 1320’s. Robert either employed an elderly stone mason with old building skills and views, to build the Keep, or he had a penchant for old building styles. The Keep is entered on its East side…..meaning that if it was attacked, the attackers, if they’d made it past the gatehouses and the courtyard in-between, would still have had to fight their way around a corner. All the while they would have had to fend off attacks from high above. After about 1300, and would be attackers who got this far, would also have probably come under attack from across the courtyard from the Tower of League in the South West corner. 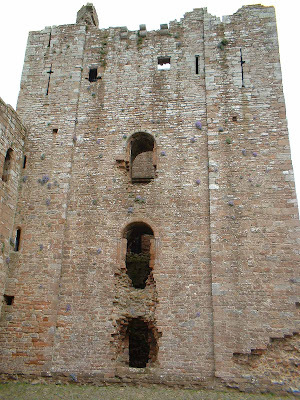 Even then, access to the Keep was blocked, as the doorway was on the first floor and covered by a substantial building. The earthwork remains of the walled garden built by Lady Anne Clifford, can still be seen cutting through the Roman fort. The gardens were planted to ensure that the castle could produce as much of its own food as possible.